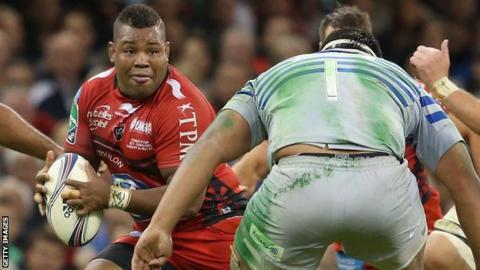 Toulon flanker Steffon Armitage's move to Bath looks unlikely after the clubs failed to agree a deal. Armitage had entered discussions over a move to the Premiership club, with a view to regaining his England place in time for the 2015 World Cup. The 29-year-old, who has won five caps, will not be picked by Stuart Lancaster while he is playing in France. But Bath coach Mike Ford told BBC Radio Bristol the parties had been unable to reach a financial agreement. "We contacted Steffon and Toulon and the deal was nearly done," said Ford. "When a player is contracted at another club there's a lot of complications, in terms of the transfer and the finances involved. "We've not been able to do it and it's disappointing because he would have been a fantastic signing for us. "He'd watched us this season and knew his style of rugby would have fitted in. It would also have been fantastic for England, with the World Cup around the corner." Bath are looking for cover in their back row, with Francois Louw, Matt Garvey, Alafoti Fa'osiliva and Carl Fearns sidelined through injury and Leroy Houston facing a potential suspension following an incident in the defeat by Wasps. Ford went on to say that Armitage's switch would definitely be off if he played for Toulon in the European Champions Cup this weekend, as he would then be unavailable for Bath in the competition. The back-rower signed a three-year contract extension with the European champions in November 2013. He won the last of his England caps in 2010, but has excelled since moving to the Cote d'Azur, winning the European Rugby Cup Player of the Year award in 2014 as Toulon claimed back-to-back Heineken Cups. Speaking to BBC Sport on Monday, Toulon head coach Bernard Laporte said their was a real chance of Armitage returning to England if it helps his World Cup chances. "He has a contract [with Toulon], but if the England coach says if he plays for Bath or for Saracens then he will play in the World Cup, I think he has to play for these clubs," he said. Because of his international exile - England only pick home-based players unless there are "exceptional circumstances" - Armitage was exploring the possibility of using Olympic eligibility rules to play for France. 2000 - The International Rugby Board adopts a rule that states once a player has represented one country at senior level, they may never play for another. 2014 - As part of Sevens' entry to the Olympics in 2016, the IRB adopted IOC eligibility rules, which mean that a dual-qualified athlete can switch allegiance to another nation, provided they have a passport for the country they are changing to.They must also serve a stand-down period of 18 months, while in rugby union there is an additional requirement that the player must appear in at least four World Series Sevens events before the change of allegiance is complete. Those rules, introduced this summer, mean there is now only an 18-month stand-down period for players wishing to switch countries, provided they have the relevant passport. However, the International Rugby Board has clarified that he would have to compete in four World Series Sevens tournaments to qualify for Les Bleus, and it is understood Armitage has now accepted this may not be possible.